CHEERS! : The team members from the West Riding Refreshment Rooms proudly show off their Campaign for Real Ale Pub of the Year award. The West Riding Refreshment Rooms at Dewsbury Railway Station has been named as Pub of the Year by the local branch of the Campaign for Real Ale. Proud bar manager Ros Arden was presented with the award by chairman of the Heavy Woollen branch of CAMRA, Alan Mapplebeck. But the pub, which is part of the Transpennine Real Ale Trail and was made famous by Oz Clarke and James May, is no stranger to success. 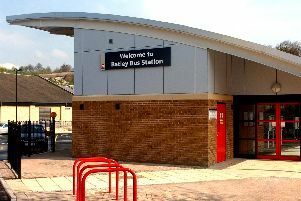 Paul Dixey said it had won the local and regional award several times before, and was named as a runner-up in the National competition.